Eastern North America is host to an astonishing entomological phenomenon found nowhere else in the world. Cicadas in the genus Magicicada spend 17 years (or, more rarely, 13 years) maturing underground before emerging en masse to mate. These emergences take place in May or June and involve several species, each with a different song. The odd, long intervals between mass emergences is thought to confound predators and overwhelm their appetites when they occur. For more information about these fascinating animals, visit Magicicada.org. Periodical cicada emergences are a boon to animals that eat insects. 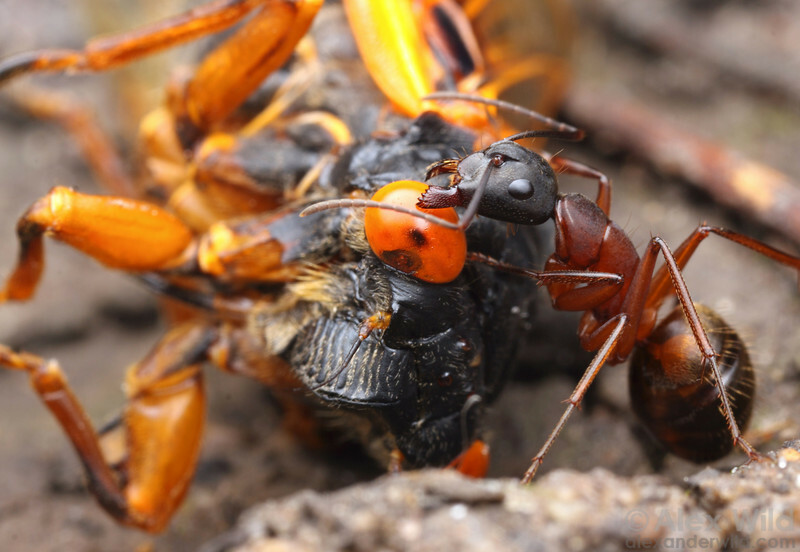 Here, carpenter ants carry brood XIX cicada carcass back to their nest. Allerton Park, Illinois, USA.